After what would prove to be the final appearance of introductory material by “J. J. McC.”, we meet Ellery traveling through Trenton, New Jersey on his way back to Manhattan. He runs into old college buddy Bill Angell, now a local prosecutor, who mentions that his sister Lucy is married to “a traveling man — Joe Wilson”. Wilson sells cheap jewelry and trinkets pretty much door to door; not much of a profession to confer social prominence, but Bill has to admit that Lucy and Joe are mad about each other, even though he’s away four or five days a week. Bill and Ellery make a spontaneous arrangement to give Bill a ride to the city in Ellery’s ancient Duesenberg roadster, but first Bill has an appointment to meet his brother-in-law. Bill drives down a deserted road down by the Delaware River and finds more vehicles than he’s expecting; one huge Cadillac and his brother-in-law’s old Packard, standing outside a tiny old shack. As he sits there for a moment, a beautiful (and unveiled) woman’s scream pierces the night — she exits the building, hops into the Cadillac and flees in panic. Inside the shack, Bill finds his brother-in-law Joe, dying on the floor. Joe has just enough time to gasp out, “Woman. Veil. Heavy veil — face. Couldn’t see. Knifed me … Bill, Bill,” and a few more enigmatic words, then expires. It soon proves to be the case that Joe Wilson of Trenton, with his pretty wife Lucy, is also the wealthy Joseph Kent Gimball of Park Avenue, with his snooty wife Jessica and stepdaughter Andrea. That bigamy forms the basis for the remainder of the murder case, and the problem becomes an unusual one — who was murdered, Joe Wilson or Joseph Kent Gimball? Despite the obvious problems inherent in two separate lives and families, it’s not precisely clear exactly why he was killed, although the million-dollar life insurance policy whose beneficiary was recently switched to Lucy’s name might be a good motive. The press, personified by Ella Amity, are in full hue and cry as Lucy goes on trial for the murder. The trial takes place over a large portion of the book, and brings forward all the evidence and relevant testimony. Lucy is convicted, but Ellery knows that one character has information that is not being revealed. When he pressures this witness, all of a sudden a set of new information comes out about what happened at the shack between the murder and Bill’s arrival. One tiny set of apparently inconsequential facts gives Ellery the solution to the case. After the traditional Queenian “Challenge to the reader” (its final appearance) in which the reader is informed that all the information required to solve the case is available, Ellery crowds all the suspects and investigators into the little Trenton shack on the river. Ellery begins a chronological reconstruction of events and announces that the surprise witness still has an important revelation to make. At that point — well, let’s just say that Ellery has sprung a trap and the killer is shot down while trying to escape, remaining still unidentified to the reader. In the final chapter, Ellery explains his reasoning and defines a list of criteria that define the person and actions of “Woman. Veil. Heavy veil — face” and one by one the suspects are held against it. All of a sudden, a bunch of tiny clues and references make sense as Ellery exposes the surprising murderer in a dramatic finish..
What’s interesting about this book? I’ve always been fascinated by this volume because to me it seems to mark a dividing line in the writing career of the EQ cousins. The nine previous novel-length adventures of Ellery Queen from 1929 to 1935 comprised the “nationalities” series; each volume contained a word denoting nationality and had other similar features like the “Challenge to the Reader”. I think of this as Period One in the EQ oeuvre. (And I owe that nomenclature to Francis M. Nevins, Jr., from his book on EQ, Royal Bloodline, although I haven’t adopted his schema dogmatically.) 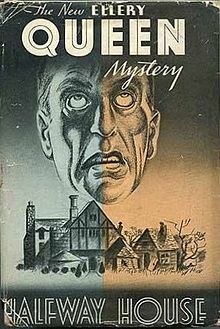 Then came Halfway House and then, after four further volumes (I’ll explain these later) came what I consider to be the first of three linked EQ masterpieces, 1942’s Calamity Town, the first Wrightsville novel. 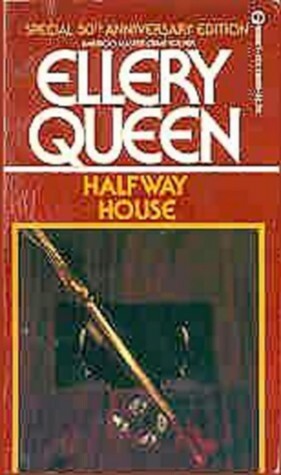 And I see that there’s a direct relationship between Halfway House and Calamity Town … so to me, this is the book which begins Period Two of EQ’s work, which contains the cousins’ finest achievements. The cousins’ path from Period One to Period Two was not smooth, but clear. The nationalities series, Period One, contained puzzle mysteries that were technically brilliant, highly complicated, and for the most part not containing any realistic emotions. They usually took place in a bubble outside of the world, regardless of whether the setting was a Manhattan department store or the top of a mountain menaced by a forest fire; the characters were only as realistic as they needed to be in order to render their necessary actions believable as they furthered the plot. I will resist using the word “cardboard” here, because generally EQ were better writers than that, but for the most part the Period One books are more about the puzzle than the people. If you don’t believe me, reflect that in The Chinese Orange Mystery we don’t really know or care what the name of the victim is (and why). And then — something happened. I’m not sufficiently familiar with the personal lives of the cousins to know what happened … perhaps nothing “happened” in any concrete sense. Certainly the books of Period One had been operating in the same marketplace as S. S. Van Dine, and the star of the mystery universe that had been Philo Vance was starting to wane; the EQ cousins were sufficiently canny to understand the market forces and move to meet them. I think they made a conscious decision to try to achieve a more lucrative commercial return on their labours by selling Ellery Queen to Hollywood as a series character, and in order to do that — I’m on shakier ground here — they felt they had to free him up from the ratiocinative pattern in which he was embedded. So instead of calling this work The Swedish Match Mystery, which possibility is specifically mentioned in the “J. J. McC.” introduction, EQ broke the nationalities pattern and started to change Ellery Queen’s style to respond to the market. My contention is that they did so by starting to introduce emotional content into the novels’ construction and trying to make these novels work as both pure puzzles and novels about real people, partly in line with what Dorothy L. Sayers wanted; a “literature with guts”. And so after a few false starts and experiments, they arrived at their nearly perfect mingling of puzzle mystery and novel of emotion — the first three Wrightsville novels (Calamity Town, 1942; The Murderer is a Fox, 1945; and Ten Days’ Wonder, 1948). Now, the path between the nationalities novels and the magnificent Wrightsville trilogy has a few bumps, as I suggested above. There’s a couple of novels in there that I think of as the Hollywood false starts, in which EQ wrote a few novels that were possibly intended first as screenplay scenarios, perhaps for the many Ellery Queen films in process or perhaps merely as the basis for filmed mysteries. Again, I can’t prove this by reference to any biographic material compiled by better-read researchers than I; this is merely, to me, what the books “feel” like. The skimpy characterization, emotional flatness, and focus on surprising and fantastic elements makes it probable, for me, that The Devil to Pay (1938), The Four of Hearts (1938), The Dragon’s Teeth (1939), and There Was an Old Woman (1943) were fast-and-dirty attempts to turn unsold screenplays into income. I have to say I’m not sure what to make of The Door Between (1937); to me it’s just not a very good novel. Certainly EQ are trying to inject some emotional reality into it, but the fantastic elements of the crime and its solution are just way over the top for me. This novel for me ends up being either a novelization of a screenplay, written at a time when EQ didn’t understand screenplays very well, or else the beginnings of what would become the Wrightsville novels, when EQ didn’t understand the kinds of emotion that work within the murder mystery context. All these Hollywood novels, to me, have an unreality about them that makes them artistically unsuccessful; Halfway House is not very realistic, but it tries to stay grounded in the real world. In my view the relationship between Halfway House and Calamity Town is quite clear; almost as though EQ revisited the material they’d covered six years later and wrote with a surer, clearer vision to produce the masterful Calamity Town. Halfway House attempts to introduce the effects of the press into the situation, to show the reader what happens when a “fine old family” like the Gimballs becomes the focus of the gutter press. This repeats itself in Calamity Town but with much more personal and telling effect. It’s what happens in the real world, and it’s important to note that it represents an external force that acts upon the situation that cannot be controlled by Ellery and/or the police; whatever the opposite of a “closed circle” mystery is. This is EQ opening up the form to take a wider reality into account. The extended courtroom sequence of both novels is something different for Ellery Queen — perhaps it’s a useful way to get evidence before the reader when the continuing character of Sergeant Velie isn’t appropriate. (EQ has a habit common to many mystery writers of shoehorning in physical evidence by letting police officers tell it to Ellery. “No fingerprints on the gun, Maestro,” said Sergeant Velie.) 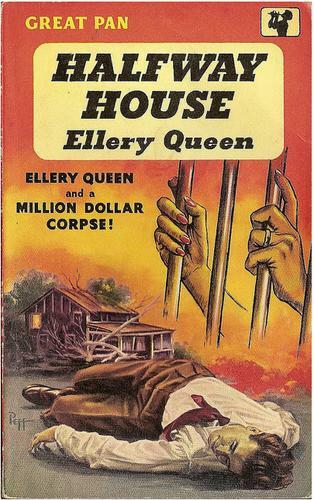 It might even be that EQ realized that Erle Stanley Gardner was becoming more popular just as the Van Dine star was waning, and decided to move in the direction of courtroom drama. Even the puzzle structure of both books is similar, although I’m going to be deliberately vague here; there’s one central character who is concealing vital evidence required to produce the solution, and that person is doing so for similar reasons in each case. Ellery has to break that person down in order to solve the case. Where Calamity Town rises above Halfway House is in EQ’s brilliant casting of the town of Wrightsville itself as a character, and the intelligent way in which EQ used Wrightsville to anchor and sustain the books served as a model for such future efforts as The Glass Village and The King is Dead. 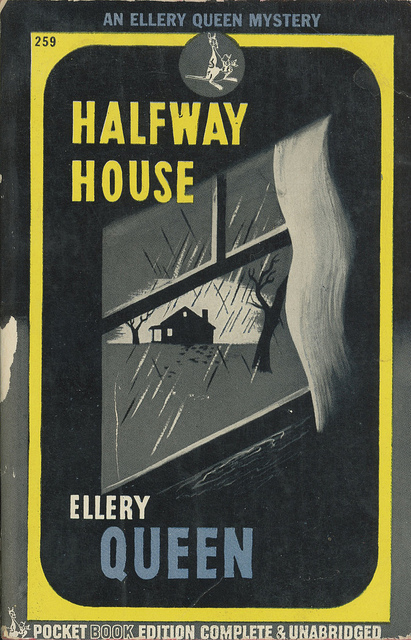 So to sum up, without giving a complete history of every Ellery Queen novel and its place in the various Periods of the canon; Halfway House is different from its predecessors and marks, for me, the bifurcation between Period One (nationalities) and Period Two (Wrightsville). This novel has emotional content where the Nationalities do not, and attempts to bring in the real-world context in which murders are done and solved. It gives the cousins a chance to continue appealing to their fan base that enjoys the complex and emotionless puzzles of Period One, while at the same time giving themselves a familiar structure within which to experiment with depicting emotional realities. And yet it is a strong puzzle with some very surprising elements, and a large amount of logic that underlies the solution. It’s not a great novel, but it contains the bones of greatness within it; if you read this and then read, or re-read, Calamity Town, you’ll understand from where that masterpiece arose and the elements that went into making it. And yet if you’re simply looking for a darn good puzzle mystery, just think for a moment that you’re in an alternate universe where the cousins wrote The Swedish Match Mystery — and you’ll enjoy this final novel in the nationalities series. In the Tuesday Night Bloggers’ brief time spent looking at Ellery Queen, I also intend to have a look at another novel that I think is pivotal in the EQ oeuvre; the transition novel between Period Three (EQ’s “imposed patterns” period) and Four (EQ’s writer’s block), 1958’s The Finishing Stroke; I also intend to have a look at some Ellery Queen rarities and oddities from the lesser-known byways of the printing universe. Stay tuned! This entry was posted in Detective fiction, Genre fiction, Golden Age of Detective Fiction, Mystery, Novel and tagged Ellery Queen, Erle Stanley Gardner, Francis M. Nevins Jr., S. S. Van Dine. Fascinatin, Noah, I learned a lot about the books from this, and got some ideas for which I should read next. My assignment of EQ’s books into Periods isn’t canonical by any means … and probably a bit more jaundiced than some. And there’s a LOT I’ve left out about what the cousins were up to with monetizing Ellery. But happy to be of service — if you want EQ’s best work, read Calamity Town and my own favourite, The Murderer Is A Fox. Great post, Halfway House sounds like a tempting read. Currently got The Origin of Evil in my TBR pile, what sort of phase or group do you think it would fit into, within the Queen canon? Happy to give my opinion. I put The Origin of Evil into Period Three, “Imposed patterns”. In the book, you find that an unhappy husband is receiving a series of weird gifts that no one can explain — an alligator wallet, a pile of worthless stocks and bonds. Essentially the plot of the book depends upon discerning the motif that links all the gifts, by imposing a pattern. Not EQ’s best work to my mind, partly because there is a sub-theme of surprisingly unpleasant misogyny. Not even the comedy relief character is very pleasant in this one, and Ellery is downright grumpy. oh dear! A grumpy Ellery and misogyny doesn’t sound much fun. I think the problem with reading these books when I was a teenager is that there was much I couldn’t appreciate about the more mature aspects of the story. 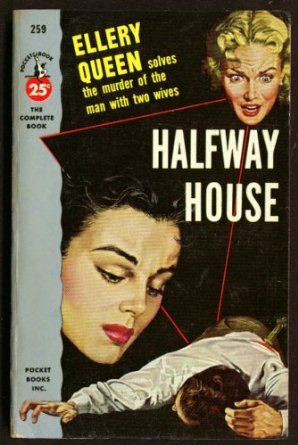 I remember thinking that Halfway House seemed prosaic in comparison with all the international mysteries, but then I probably didn’t get a lot of it at the time. You made it sound much more delightful than I remember, Noah! Very interesting. 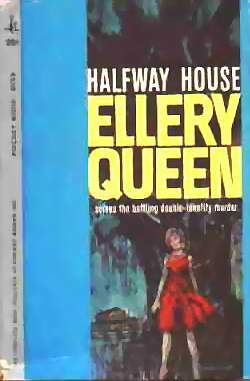 One day I will read more Ellery Queen and explore the different periods. 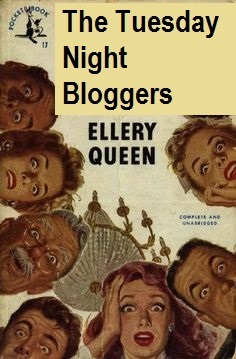 I am one of those who read a lot of the Ellery Queen books when I was much, much younger. I enjoyed many of them, and that is all I remember. For someone like, say, Patricia Wentworth, the early books are quite like the last ones. But EQ had some very dramatic changes in style and even sub-genre over the years, from copying S.S. Van Dine/Philo Vance to writing crummy procedurals and licensing out their name. But there’s brilliant novels studded here and there throughout their long career; the interesting thing is trying to figure out which they are and why they came to be. Yikes — If you didn’t like Spanish Cape, the book that immediately preceded Halfway House, there’s not much difference. Perhaps let me suggest Calamity Town instead. There is no Queen novel anything like Cat of Many Tails, to be sure. I had problems with it too, certainly. It’s pretty clear that EQ had decided to experiment with romance but it’s safe to say they weren’t experienced at writing about it yet.